Discussion in 'Beginners/FAQ' started by MaxOfMetal, Jan 30, 2012. People do not seem to answer here anymore. Lets give some help for all its worth. Id like to know what would be the price of a RC7 mahogany (ebony fretboard with circle dots) made in USA. Its made in 2009. Not manufactured anymore and its pretty rare. Found only one similar model with maple fretboard on reverb but the dude is asking 2800e. 2800 Euro is pretty steep for the particular model, I saw a limited edition Dean Xeno Custom shop RC8 for half of that. Especially given that it has scratches and is not mint. You could score an RC 7 USA for less than 1400 Euro including shipping/customs easily, now if you are after the particular 2009 model and do not accept other years choices then you need to shop around more. Hey, I'd like to know how much can I get for My Ormsby GTR TX 7. It's all stock, no changes made. It's in very good condition (not mint because it's 3 years old guitar). I'm at work unfortunately so I don't really have time to search for exact specs but if someone want to help pal out, you can check them at Ormsby's page. I'm the second owner and I know for sure that this one is from one of the first runs from 2016. I'm located in Poland if that helps somehow. It comes with Ormsby case. I have the guitar in my awatar if you don't mind checking it out Thanks in advance! I can see new ones of the 2018 line for 1150-1250 Euro but they are in Australia so potential buyers have to check heavy shipping costs and customs when calculating. Since you are in Europe, you can throw it for even more and sit back and wait for the response. Logically, you should get some good money if you put it on ebay, used ones sell fast around the 1k-1.5K euro mark. Of course, other more knowledgeable members on Ormsby prices can comment. I'm selling my Schecter Blackjack A7 for £400 inc hardcase. Is that steep? I think it's a fair price if the guitar is in at least good condition. And you're adding hardcase so for me it's a good deal. Cheers - it's got a little bit of buckle-rash on the back but no major dings or dents. 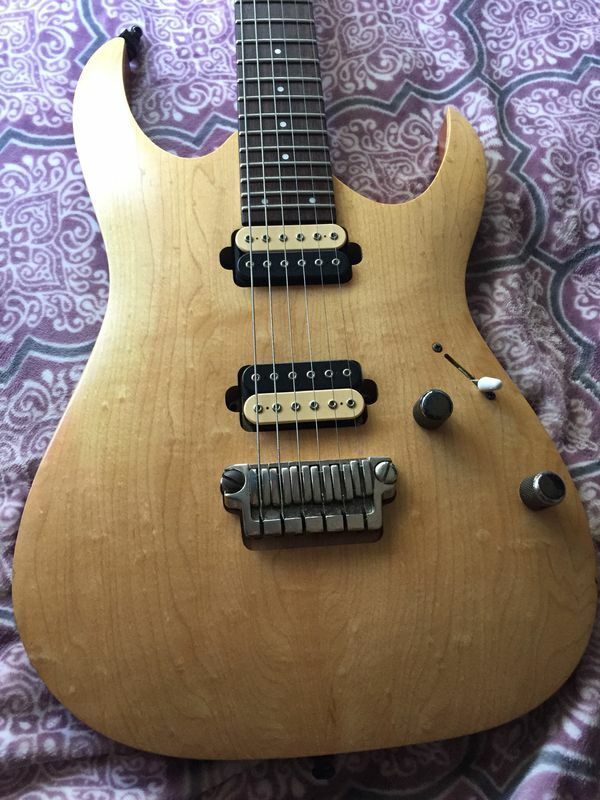 Hello, looking to purchase my second guitar (noob here) I came across an Ibanez Prestige RGA121 being sold locally for $500 USD. The current owner doesn't know anything about the guitar, he claims he received the guitar as a gift from a friend who moved away 5-6 years ago and has since lost contact with said friend. I couldn't find any other RGA121's with the same pickups offered stock so I'm assuming they've been replaced but the current owner says he doesn't play guitar at all and has no idea what they are. The switch selector tip is also white (i've only seen black in stock photos). My other concern is the bridge on this guitar, it's a Gibraltar Plus bridge that is discontinued and I can't find any replacements online, in the pictures the bridge looks fine but should something ever happen would I just be out of luck? I'm also wondering if you think this is a fair price? I'd say that's a good deal, especially since the only thing that really needs upgrading on these is the pickups and those are definitely not stock pickups. Guessing Dimarzio's but not certain. I wouldn't worry about the bridge, it's not as nice as the newer Gibraltar 2's but it's still overall quite comfortable. Not sure why you would want a replacement really, it's rare for a decent quality bridge to need replacing. Exc cond Jackson sl7 pro black for $699? Too much? Push for a lower price, 699 is not extreme but not a steal as well. Hi. I have an opportunity to buy used Ibanez RGA8. The guitar is without paint (natural body), setup was done by a tech, tone knob was removed and a coil switch was installed in its place and stock pickups were repleaced by BKP Nailbombs. I can tell by the pictures that it is in pretty good condition etc. Price is 585 USD. The RGA8 are not expensive but since he dropped work on it and those BKPs, then why not. Haggle and take it to 500 if possible. Seems like a good deal, especially if he gives a case with it. I have a Line 6 POD HD500X wtth a Gator case that I want to sell- what is a fair asking price? $300-$350? Today I got an offer for 1.000€. Best offer I had in 5 months. Do you think I can get more out of it? Price is right imo. Although it depends on how hot this item is. 350$ gives you some room to haggle.